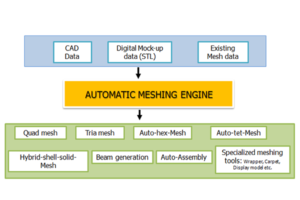 A set of automated and powerful interactive meshing functions allow users to create mid-plane meshes of complex plastic and casting parts with ribs and other intersecting features. 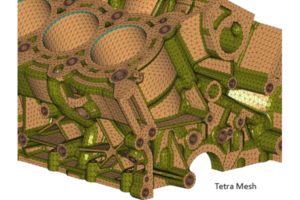 Variable thicknesses as driven by the CAD geometry are automatically assigned to the mesh. 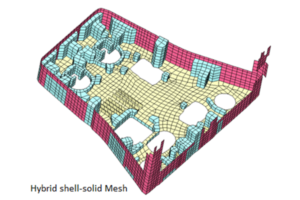 MeshWorks provides several methods for getting tetrahedral mesh. Tetra mesh can be controlled by a variety of factors such as gradation factor, layered tetra mesh, growth rate etc. 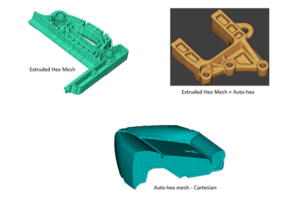 The automated cartesian hexa mesher allows users to create 100% hexa meshes of complex parts that have a high volume to surface ratio (‘chunky’ parts). The extruded hex mesher can rapidly generate hex dominant meshes for parts whose features are aligned in a specific direction. The ‘thin-wall-hex-mesher’ can rapidly convert a mid-plane quad dominant mesh to a hex-dominant mesh. Users can combine all of the hex mesher functions to generate a geometry hugging hex dominant mesh with minimal number of penta elements. 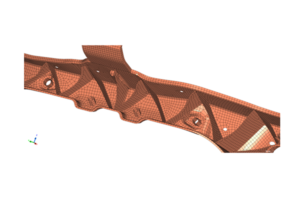 A patented parametrization methodology generates parametric meshes during the meshing process itself. The parametrization is driven by CAD features and user provided rules & templates. The mesh generated is highly associative to the CAD geometry. This allows for highly automated update of the mesh as and when the CAD geometry changes and viz versa. 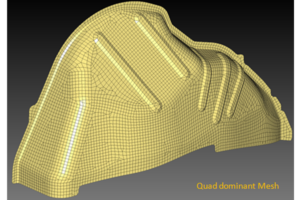 Meshing templates corresponding to different attributes such as stress/durability, stiffness/NVH etc. can be assigned to the CAD data. As a result meshes corresponding to all the different attributes can be generated from one single model eliminating the need for duplicated effort.